Put a Spring in your Step in Marylebone! Marylebone – strange name whose pronunciation has been under scrutiny for many years, but where did the name come from? It comes from the name of the Old Tyburn church which was pulled down and relocated in 1400 to what is now known as Marylebone High Street. The church was re-named St Marys and the areas soon became known as St Mary’s on the Bourne (“bourne” meaning small river or stream), then St Mary-la-Bourne, then St Marylebone. So it is basically translated to “the church on the river”. Several spellings have included Mary-le-burn, Mariburn, Mary-la-bonne and my favourite – Marrowbone! 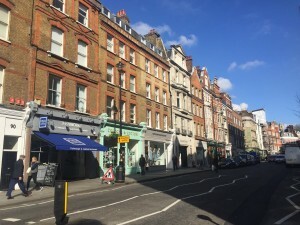 Nowadays Marylebone is characterised by major streets such as Baker, Wimpole, Marylebone High & Harley, and is regarded as one of London’s most salubrious areas. On buzzy Marylebone High Street and close by you will find a plethora of fabulous boutiques including hair salons, clothes shops including charity shops which are a must for anyone searching second hand designer gear! Restaurants and watering holes, and talking of Marrowbone, even the best butcher in London – the Ginger Pig has a branch here. Being payday for many of us, you could venture this way this weekend! Over the years the area has drawn in all sorts of folk such as Charles Dickens, the actress Vivien Leigh, the Cambridge spies Anthony Blunt and Guy Burgess and many more so keep your eyes open for those little blue plaques! As well as all the above you will also find a delightful 1 bedroom property that has just come on to the market with us at Davis Brown Estate Agents. It’s at Melcombe Regis Court, so if this area appeals do pop in to us at 1 Margaret St in Fitzrovia and we will happily introduce you to the flat! Previous PostFish FridayNext PostBeautiful Blooms!